This is unconscionable, and what often happens when the polluter is a government or government contractor. In Oak Ridge, Tennessee, I won declassification of the world's largest mercury event, which the nuclear weapons plant contractor and lapdog federal managers kept secret until May 21, 1983. In my swoon July 11, 1983 testimony before then-Representative Albert Gore, Jr. and two House subcommittees, I called for criminal prosecution of Union Carbide and Department of Energy officials. That never happened in Oak Ridge. Nor did it happen at Rocky Flats nuclear weapons plant in Colorado, were FBI Special Agent Jonathan Lipsky's search warrant affidavit documented hundreds of environmental law violations. Environmental lawbreaking from nuclear weapons plants to state and local government agencies too often goes undetected and undeterred. While we've caught and partially remedied pollution by the City of St. Augustine, no one ever went to jail for it here, either. . These Florida Fire College pollution victims in Ocala deserve the truth. It took about four months for state health officials to notify Ocala residents about potentially elevated levels of the chemicals, emails obtained by the Times/Herald show. 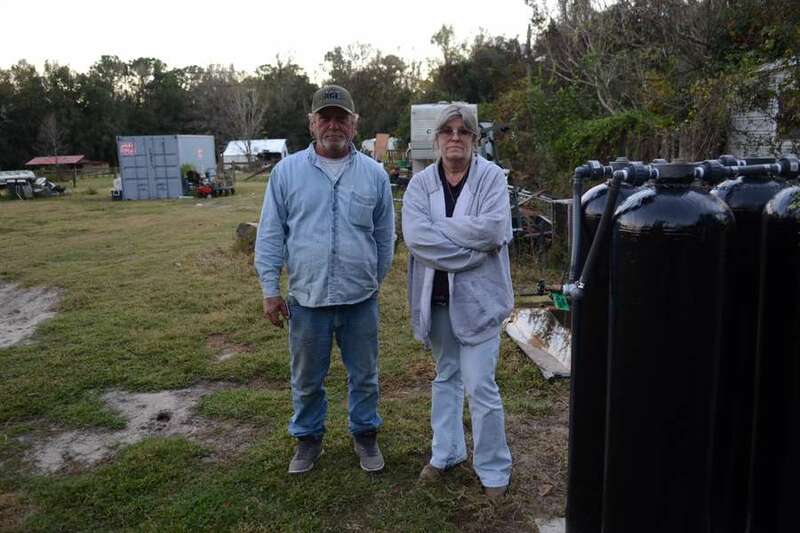 OCALA — Linda Lawson thought little of drinking the water from the decades-old well in her backyard, less than half a mile down the road from the Florida State Fire College in Ocala. That changed when her daughter-in-law answered to state workers knocking on her door one afternoon. They came to test the water, a worker said. She only began to worry when Mark Lander, the head of the Marion County Department of Health, came by at 8:30 one evening in early November with word that she shouldn't drink from the well anymore. The unlit dirt path to her Central Florida home almost never received visitors, especially at night, and her husband Tim even pulled out his gun with concern that Lander might be an escaped inmate from a nearby prison. Lander, who declined to comment for this story, delivered a letter that night informing Lawson's family that chemical levels in their well water were higher than deemed safe. He gave them a couple cases of water and told them to drink only bottled for the foreseeable future before he disappeared back into the night. In August, the Department of Environmental Protection confirmed that flame retardants containing perfluorooctane sulfonate (PFOS) and perfluorooctanoic acid (PFOA) had been used at the Fire College in the past. In early September, the college was told to only drink bottled water. Lawson's home was one of three well sites — a Marion County fire station and Texas-based mining company Lhoist North America were the others — where preliminary tests indicated the water had elevated levels of the chemicals, which early studies have suggested can be carcinogens. Other impacts in humans include high cholesterol, thyroid disorders, adverse reproductive and developmental effects and some types of cancer. It took about four months for state health officials to notify Lawson and others in the community about potentially elevated levels of the chemicals, emails obtained by the Times/Herald show. In September state health officials began discussing means of informing the Fire College, but it wasn't until late October that they discussed notifying the rest of the nearby community. While state health officials debated for months how to word messages to those affected and put off informational open houses because of Hurricane Michael, neighbors bickered with local health officials asking when their water would be tested. Some preemptively began buying cases of water each week, fearing their own wells might be contaminated. Recently, six former employees of the Fire College joined a class-action lawsuit against flame retardant manufacturers, alleging their exposure to toxic chemicals caused serious medical conditions including thyroid disease, breast cancer and kidney cancer — the same chemicals found in Lawson's drinking water. Les Beitsch, a former deputy secretary in the Florida Department of Health, speculates that health officials delayed notifying Lawson and the two other well users because of the impending election. He was effectively fired in November, he said, because he pushed back against the idea of any delay in notifying well-water users of the problem. Gov. Rick Scott's office rejected the suggestion that political considerations played any role in the notification timeline and directed reporters to the Department of Health for comment. Through a spokesman, the Department of Health said it "immediately notified well owners of results" and have "worked diligently to obtain the necessary permissions to conduct additional private well sampling." "Any assertion that this was not done as quickly as possible is false and irresponsible," said Nick Van der Linden, the department spokesman. The department notified residents on Nov. 5 — two months after the Fire College started using bottled water and three days after tests results showed contamination in their wells. Water contamination near the Fire College was made known to officials in early September after results came back from testing done by the state's Department of Environmental Protection. Of the 80 to 90 wells in a mile radius around the college, 16 wells were initially tested. According to emails obtained by the Times/Herald, levels of chemicals in the water at the college were found to be between 250 and 270 parts per trillion, more than three times higher than the advisable 70 parts per trillion for drinking water. ▪ On Sept. 9, the Fire College was given supplies of bottled water from the Department of Environmental Protection. On Sept. 12, the Fire College stopped using well water to prepare food in its cafeteria. During busy times of the year, about 50 students and 30 staff use the water on campus. ▪ On Oct. 2nd and 3rd, the DOH collected samples from 16 nearby wells, including the Lowell Correctional Institution (a women's prison), a convenience store/gas station, the mining company and seven residences. ▪ An Oct. 16 open house was scheduled to allow members of the public and the Fire College community to ask questions and get information about what was happening in their water supply. The open house was rescheduled due to limited time and resources after Hurricane Michael. It eventually happened on Dec. 4 — three months after the Fire College started using bottled water. ▪ On Nov. 2, the Department of Health got results back from the tests in early October and found four wells, including the Fire College, that showed elevated PFOS and PFOA levels. ▪ On Nov. 5 —two months after the Fire College started using bottled water and three days after test results showed far higher levels of contamination in their wells — letters were sent to notify Lawson and the fire station. On Nov. 6, Election Day, the mining business was notified. The Department of Environmental Protection installed filters for their wells and is providing a regular supply of bottled water for drinking, cooking, bathing and other household activities. Those letters were supposed to be sent on Nov. 13, Beitsch said, but pushback from him and some of his colleagues spurred the Nov. 5 delivery. All Lawson could gather from the two-page letter was that the Fire College might be connected to the water problem. "We've known the Fire College was there. It's been there forever," she said. "I knew they did testing back there — fire drills and stuff like that — but I assumed they did water or whatever. I didn't even know they use a foam." The flame retardant that contained the perfluorooctane sulfonate and perfluorooctanoic acid particles came in the form of a foam mean to cool the fire and to coat the fuel, preventing its contact with oxygen. Other residents in the area say that — despite requirements that additional wells be tested — they did not hear for far longer if their wells had been tested or if the same chemicals had been found in their water. In 2002, the primary U.S. manufacturer of PFOS voluntarily phased it out of production because it was aware of the looming chemical exposure and health effects on the public. In 2006, eight major companies in the PFAS industry voluntarily agreed to phase out production for the same reason. But the chemicals are made up of compounds that don't biodegrade, which allows them to remain in air, soil and groundwater for decades. Though the health department began bringing Lawson's family five-gallon jugs of water after the letter was delivered, their well water — which tested for levels of PFAS and PFOA at 932 parts per trillion — is still being used for showering and washing dishes. In addition to Lawson, her husband, and their sons' families — eight people in total — they have used the bottled water for their five dogs: Jasper, Harley, Tennessee, Bama and Giz. Their aging horse, Cody, still drinks from the well. Lawson hasn't noticed any health effects, she said, but she worries about how it might affect her or the children. "Ten years down the line, after we've drank all this water and tea and stuff, what's going to happen?" When the mining operation received the notice, it stopped using the well water for drinking and notified employees, according to a written statement from the company. The test levels were 12,000 parts per trillion, about 170 times the advisable level. According to Health Department emails obtained by the Times/Herald through a public records request, the mine's safety manager, Stephen Henrick, requested his home in Ocala be tested shortly after. He declined to comment. A spokesman for the fire station in Ocala declined to comment as well. Lawson said she still keeps the letter with her at work, where she weighs trucks for a local limerock company as a scale house operator. A few more nearby wells were tested on Nov. 8 — a horse breeder, North Marion County Middle School and a carrier company. On Nov. 28, more workers from the state came to install a filter on Lawson's well, though they were instructed to keep drinking bottled water for at least the next two months until more tests were conducted. After Lawson heard from the state, she told some other residents. She also told one of her best friends, Miriam Flores, who lives just a few hundred yards from Lawson in a mobile home with her family. At first, Flores said, she thought she would also hear from the state soon. But as days passed, Flores grew more and more worried. She warned two tenants in another mobile home on her property about the problem and advised them to buy bottled water. She began to call the Marion and Alachua County health departments, who both told her that they thought the issue was "nothing," she recalled. "I don't think they care. They don't want nobody knowing anything, and it's scary," she said at the time. After the Times/Herald began inquiring about the testing, officials finally came to test Flores' water Dec. 11 — a month after Lawson was first visited by health officials checking her well, and about three months after the department first learned of the problems in the groundwater surrounding the Fire College. At Christmas, Flores and her family continued sipping from bottles of Zephyrhills water they had bought by the case: $5 each, two or three a week. Without answers, she increasingly worried about the water from the well her family has consumed for years, or even touching what comes out of the pipes. She stopped letting her 5-year-old son, Fernando, brush his teeth with it. She even started washing the vegetables with bottled water. "Doesn't it go into your body, into your pores?" On Dec. 28, an environmental administrator with the Marion County Department of Health finally gave her an answer, she said. Her water did test for levels higher than those at the Fire College: more than 20 times the acceptable level for drinking water. Her options now are limited, she says. Health officials dropped off two cases of water but gave her no specifics on when they might install a filter on her well or if she might potentially have to pay an additional $30 to $40 a month to tap into the city's main water line instead. Flores also can't just leave the three acres of property she's lived on for four years. Because of the elevated levels of chemicals, she worries the land is worth far less than what she paid for it. "My property's value just went to crap," she said after she found out about the test results. "Not even the animals are supposed to drink it." According to scripts sent to health department employees, when residents ask about using alternative water until the test results come back, the employees they are to say "no." "There is a very low risk of any effects from short-term exposure to PFOS and PFOA. There is no reason you need to change your daily routine and an alternative water supply is not necessary. If it is your personal preference, you may choose to utilize an alternative water for drinking, cooking or brushing teeth until your results are received." The former deputy secretary, Beitsch, said he was aware of discussions going on within the department on how and when to test. He said his boss, DOH Secretary Celeste Philip, made it "very clear" that they were not to do "anything right now" at a meeting on Nov. 2. Beitsch said his training as a physician called for "sharing news of this nature in person and immediately," he said. Beitsch, who is also a department chair at Florida State University's College of Medicine, stepped into the deputy secretary role last fall at Philip's request, he said. He retained his professorship at the university, which also covered his salary for the state government role. "This absolutely crossed a line. It's disregarding possible human health consequences for whatever reason," Beitsch said. "To be doing it for reasons that are bad, like political process and elections, that would be intolerable, unacceptable and shouldn't be permitted." Beitsch's boss at FSU, College of Medicine Dean John Fogarty, said the news that Beitsch's services were no longer required came "out of the blue." "Dr. Philip called me and said 'Dr. Beitsch and I have had some disagreements and I think it's time to sever that relationship,' " he said. Fogarty said Beitsch is "not shy about expressing [his opinions]," but is "very experienced, very mature and has a pretty good worldview on problems and issues." Beitsch says he grew vocal to protect people like Flores, because "that's what public health is supposed to be about." He said it made him furious that people who don't have neighbors like Flores were — and are — still drinking contaminated water. He compared the whole situation to the lead-contaminated water in Flint, Mich.
"This is about being sure that our government organizations and agencies can do our job, that it's not politics governing science and it's not interfering with what's the right thing to do," he said. "That's been trampled on, overlooked." Almost a week after Flores found out her well tested for substantially higher levels of the chemicals, she said she still doesn't know when officials will be back to address the situation. The well is supposed to serve her, her husband, her son and daughter, the two tenants, a friend and her baby who came to stay with them two weeks ago — but all of them will continue using bottled water until they hear otherwise. Flores said she is frustrated it took nearly five months from when officials first suspected an issue at the Fire College for her to confirm that her water was contaminated. "They were trying to cover it up," she worried. "Why should I have to look on the Internet for answers?" Days after the New Year, she said officials still kept telling her — even after giving her the well results — that the water issue was "not a big deal." She doesn't know when or if she will be able to drink water out of her own faucets again, and that her weeks of pleas for assistance will continue to go unaddressed. "They didn't do what they're supposed to do," she said. "They're supposed to help people but they're not helping us. They messed up. They need to fix it."